If you have any Urgent Question about Thype Gutenberg WordPress Theme or a Pre-sale Question, please contact us directly from our live chat, or leave a comment here on Themeforest. Theme offers some custom made sliders to be use for your blog or magazine website. Navigate through the demo to view them. 10+ Premade grid blocks layouts, as you can see from the demos. You can change them with just one click select. Create various layouts for featured articles. Build the Header with our Codeless Header Builder. 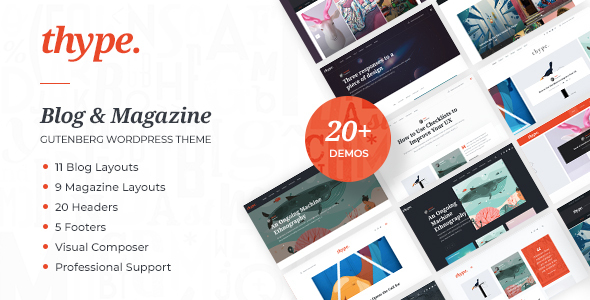 It’s easy, drag & drop and more efficiently than any other header theme options.